Who wins in a Super Bowl food fight — Los Angeles or New England? | Food and Drink | Style Weekly - Richmond, VA local news, arts, and events. 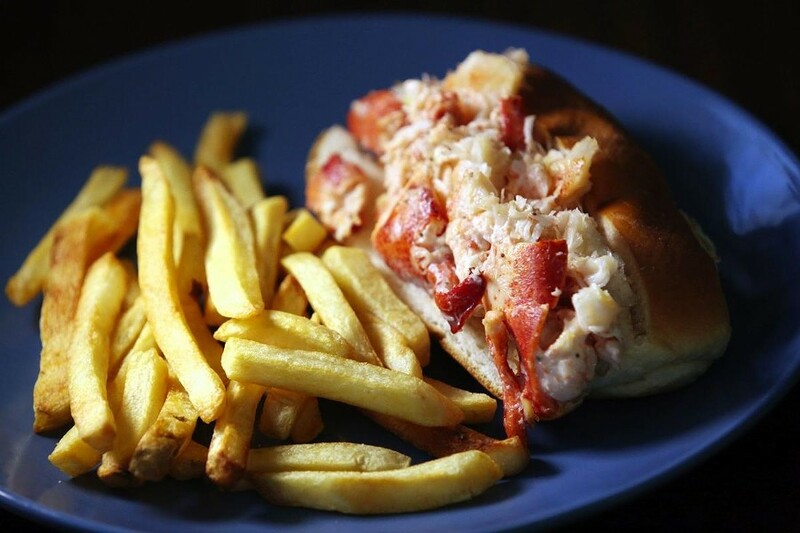 Steve Earley/The Virginian-Pilot A lobster roll for an annual Super Bowl food fight from 2017. Let’s be honest about the Super Bowl. It isn't about the game. The Super Bowl is spectacle. It's about voice-overs by Clint Eastwood, and Maroon 5 doing the halftime show, for some godforsaken reason, and trained chimpanzees selling car insurance. And, of course, it's about food and beer. The Super Bowl is one of the biggest junk food bacchanals in America. If the National Chicken Council is to be believed, Americans will eat enough wings on Super Bowl Sunday — 1.38 billion of them — to stretch 28 times end-over-end between the Rams’ and Patriots’ stadiums. In defiance of any proposed border walls, Feb. 3 will be the biggest guacamole massacre of 2019, accounting for 100 million pounds of avocado. So why worry about the game? Let's get to the good stuff. As the L.A. Rams and New England Patriots prepare to face off in Atlanta, we’re scoring the Super Bowl ahead of time, based entirely on the food and booze of the two teams and towns. Who wins the ultimate food fight — Los Angeles or New England? There is no food more perfect than a taco. There is no U.S. taco city greater than Los Angeles. Touchdown Taco Town, with a victory dance. LA 7-NE 0. New England: The lobster roll, in Milford, Conn., in the 1920s. Note that Los Angeles didn’t invent the actual hamburger. That was the Midwest. What L.A. did was make it cheesy and call it theirs. Typical Los Angeles. Touchdown, lobster roll. LA 7-NE 7. New England: The chocolate chip cookie, invented in 1938 at the Tollhouse Inn in Whitman, Mass. The chocolate chip cookie is ubiquitous, sure. But did Marlon Brando roll up to the Tollhouse Inn every week to eat a chocolate chip cookie in his limo? Didn’t think so. Touchdown for the hot fudge. LA 14-NE 7. New England: Sam Adams, largest independent craft brewer in the U.S.
“Sam Adams: Changing the Definition of Craft Beer so Sam Adams is Still Called Craft Beer Since 2006.” Nonetheless, Sam Adams ain’t Bud. Field goal, New England. LA 14-NE 10. Every cool new brewery in Los Angeles looks like an orange juice factory, turning out an endless variety of hazy New England-style IPAs. The Pats are such dedicated colonists they even managed to colonize West Coast Beer. Touchdown and two-point conversion, New England. LA 14-NE 18. Guy Fieri, the famous flameshirt of Flavortown, is not the monster some would make him out to be. But he is also not Julia Child. Touchdown, New England. LA 14-NE 25. Los Angeles: Perhaps the most vibrant merging of East Asian and Latin-American cuisines in the world. New England: Does Irish food count? An incomplete list of cuisines that are as tasty and vital and varied in Los Angeles as anywhere else in the United States: Thai, Mexican, Peruvian, Japanese, Korean, and arguably Chinese. Touchdown, Los Angeles. LA 21-NE 25. New England: Head coach Bill Belichick, who has 28 playoff victories in 38 appearances, pretty much smells like Gatorade all the time now. We have to give the edge to Danny Trejo, man. Touchdown, Los Angeles. LA 28-NE 25. Jared Goff (L.A.): 5,000 calories a day with lots of “lean chicken, turkey and fish,” according to his trainer. Tom Brady (N.E. ): 12 to 15 glasses of electrolyte water, a smoothie, a TB12-brand protein shake made with Tom Brady-powder, maybe some nice TB12-brand snacks. No coffee. No caffeine. No fungus. No dairy. No tomatoes or peppers. Jared Goff, googling idly on a sunny day: “HOW TO COMPETE WITH ANIMATRONIC CYBORG IMMUNE TO JOY.” Robot Tom Brady unexpectedly kicks field goal from opposite end zone. LA 28-NE 28. Even when he describes what he eats on his cheat day, Tom Brady makes food sound boring. Not cool, Tom Brady. Robot Tom Brady tackles himself for a safety. LA 30-NE 28. Rams win! Rams win!